Remember that time I went to Vegas and ended up coming home with a $50 bottle of nail polish? No? Well it happened. (Catch up HERE) And it took me almost year to finally decide to use it. Anyway, I spent a ridiculous amount of nail polish so you don't have to! In other words, time for a comparison post! 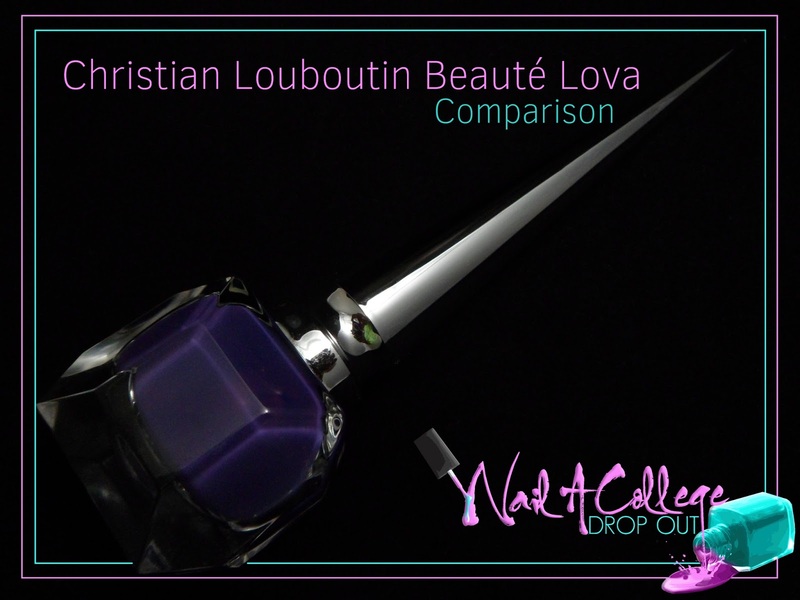 Christian Louboutin Lova isn't anything special, but I was in Vegas and it's purple. So, yeah it came home with me. Home with me and to the rest of my purple crèmes. Both Pear Nova LSD @ Three and Zoya Pinta are too dark and not even close to being dupes. Let's move on to the next group. Illamasqua Prosperity is a matte neon from Illamasqua's Rubber Brights collection. As gorgeous Prosperity is; just trust me when I tell you it isn't even close to being in the running for a Lova dupe. Meanwhile, Zoya Mira is just too red-based. China Glaze Grape Pop isn't as darkened as CL Lova but for literally a fraction of the cost it'll do the job. I know Grape Pop and Lova aren't really considered dupes, but who is really gonna challenge you on that? You know, unless they're a blogger or a Pantone employee? Fun fact, Pantone employees have near perfect color vision. Don't believe me? Want me to site my sources? Here you go. Source. Every so often I do other comparison posts. Peep those HERE. Here I am, spending an exorbitant amount of money on nail polish so you don't have to.